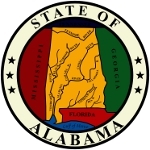 The state of Alabama is currently ranked as the 23rd most populated state of all 50 states in the U.S.A. and ranks 2nd in surface area of inland waterways. During its early years, Alabama endured much economic hardships due in part to the fact that it remained dependent on agriculture. It wasn't until after WWII that Alabama began to experience significant growth as its economy began the switch from agriculture to specialized interests in industrial manufacturing, mining, education and technology. Furthermore, many military facilities were established under the U.S. Army and U.S. Air Force during this time period, which increased job opportunities within the state. Alabama is known as the Yellowhammer state, a name originating from the state bird. The state tree is recognized to be the LongLeaf Pine tree while the state flower is known as the Cammellia. Montgomery remains the capital of the state of Alabama to this day however it is not the most populated city in the state. Birmingham takes that honor with a population of roughly 1.1 million people as of the 2010 census. The largest city in reference to land area is Huntsville which is also the fourth largest city in the state. According to the 2011 census, the population of Alabama is roughly 4.8 million, which is a .48% increase over the previous year. Alabama's population is made up of 68.5% White people, 26.2% African Americans, 1.1% Asian, and the remaining is a mix of many other ethnicities. Compared to the other states in the United States, Alabama ranks as the 13th overall largest state in the country with a land area of 52,419 square miles. Just over 3% of this area is occupied by inland waterways, while a stunning 60% of it is considered a gentle plain with a small descent facing towards the Mississippi River and the Gulf of Mexico. 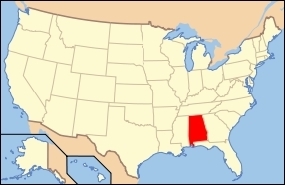 Alabama is bordered by Tennessee to the north, Florida to the south, Georgia to the east and Mississippi to the west. Today Alabama is widely know for its college and educational programs. As a part of that, The University of Alabama has developed a highly successful college football program which draws the attention of hundreds of thousands of fans each year. In addition to the outstanding football program, The University of Alabama is also ranked among the top 50 universities in the country, excelling in Law and Business areas of study. Many people visit Alabama each year for vacations to visit many of the attractions within the state such as its beaches lining the Gulf of Mexico coast or any of the forest covered mountain campsites and trails. Alabama is also considered to be one of the best fishing states in the country within its inland waterways, making it an ideal vacation choice for people of all ages and interests.